KEYNOTE SPEAKER: Christopher Piehota, Executive Assistant Director, FBI Science and Technology Branch. The FBI is mobilizing a wide range of advanced scientific techniques and operational technologies to counter terrorism and criminal threats. Employing about 6,200 professionals, the Science and Technology Branch supports the FBI mission by discovering and developing innovative science and technology capabilities that enhance intelligence and investigative activities. 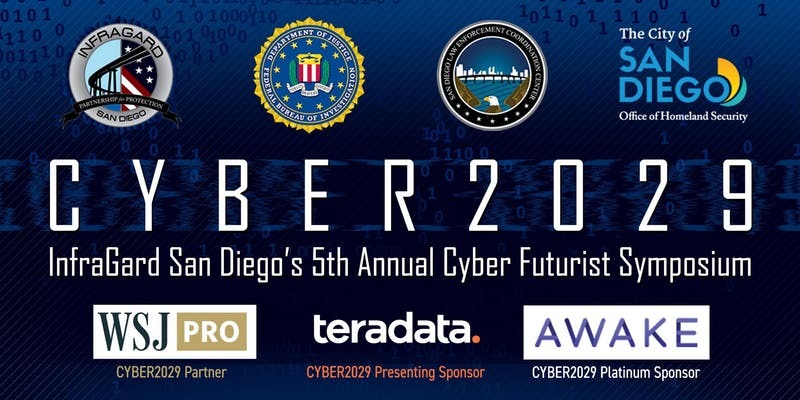 CYBER2029 is co-hosted by FBI San Diego, the San Diego Law Enforcement Coordination Center and the City of San Diego Office of Homeland Security. COST: $10 for InfraGard members, $20 for non-members. Free for current law enforcement, fire and active duty military – must register with a valid government email address.